You may find it comforting to know that most children will bite at least once before they turn 3 years old. It’s not uncommon for a child to go through a biting phase during their toddler years. But why does your child bite? Can you prevent your child from biting in the first place? How should you respond if your child bites you or another child? What can you do if biting persists? It’s important to note that the reasons why your child is biting will vary depending on their age. For example, a baby might bite if they are teething. Whereas, a toddler may bite if they are unable to communicate their wants or needs in a particular situation. It’s not always possible to prevent biting. However, you may be able to read your child’s language and learn to spot when they’re about to bite. There may be particular patterns that you recognise which become ‘triggers’ before the actual bite occurs. If you notice that your child is about to bite, try distracting them with a toy or redirecting them towards another activity. You can’t always prevent biting, so it’s important to be aware of how to respond appropriately according to your child’s age. A teething baby wouldn’t understand words like, ‘No’. Instead, try using chilled teething rings and cold cloths to chew on or teething gels to soothe their pain. As children develop and begin to understand words, you can try using age-appropriate language. Even for a toddler, it can sometimes be difficult for them to understand that their actions can have a negative impact on another child or person. Therefore, it is important that when you try to manage the situation where a child has bitten that you use age-appropriate wording or picture prompts to support your message. 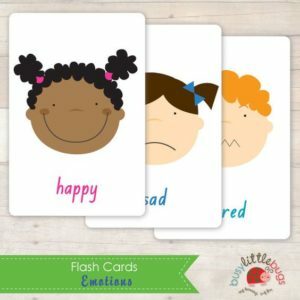 Picture prompts are particularly useful to support younger children’s understanding of emotions. It is important that the child who has been bitten is comforted by their parent or carer. If your child is the one who has bitten, then ensure that you approach the situation in an age-appropriate way. For children under 3 years of age, this may mean that you remove them from the situation. Use simple language to explain what they have done. For example, “That wasn’t kind. That’s hurt the other child. The other child is upset.” Use short, simple sentences to ensure that they understand the message. This is where you may find picture prompts useful when describing how another child may feel. If possible, you should make sure your child apologises. Most children will naturally grow out of a biting habit by the time they reach 3 years of age. There are some strategies you can try to help your child overcome a biting habit. You will need to be persistent if these are to work effectively. There is a book that our staff use in our nurseries you can try called, ‘Teeth Are Not for Biting‘ by Elizabeth Verdick. The book uses simple words which can help young children discover ways to cope with frustration and other biting triggers. Consistently reinforce the behaviour that you expect. For example, “use your kind hands” or “be kind to your friends”. Encourage your child to “use their words” when they become frustrated or upset. Many people forget that children do not always understand the reasons behind having to do something, like sharing. In a child’s eyes, having to give up a toy or activity is a highly emotional decision. Bear this in mind when you are asking your child to share. It’s important to reward good behaviour when you see it, like sharing, being kind or showing patience. Remember to praise your child if they are playing nicely or using words to express their feelings. While we don’t use reward charts at our nurseries, they can be an effective way of encouraging good behaviour at home. For instance, your child could collect a sticker each time they behave well. When they receive enough stickers, they could choose a reward or treat like going to the park or choosing a bedtime story. Be careful to make sure that rewards are not always a material item. Activities that you can do together are usually a great reward. 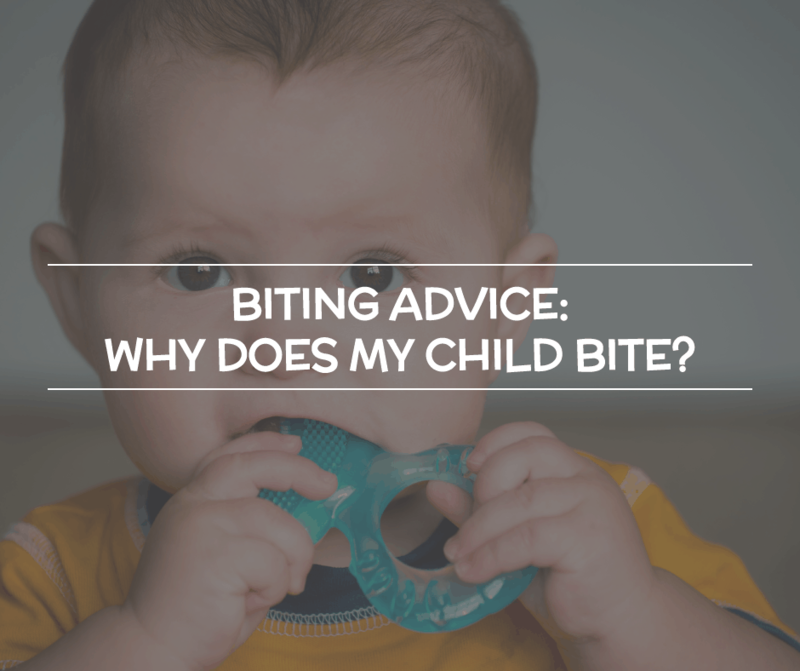 If you’re worried that your child isn’t breaking their biting habit, then you should try talking to professionals, friends or relatives to ask for their advice. You can always speak to your Health Visitor, who is available to you until your child reaches 5 years of age. Our nursery staff have plenty of experience in working with children who bite, so please talk to them and ask for their help as well. Whatever you decide to implement, make sure that you are consistent. Consistency is the difference between a strategy working or failing.